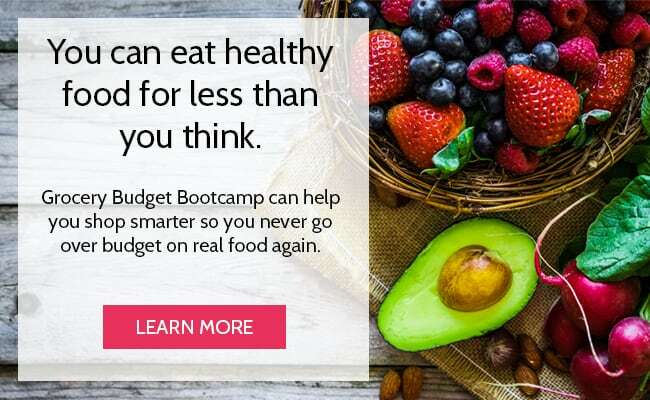 In order to get out of debt, we learned how to create a grocery budget. 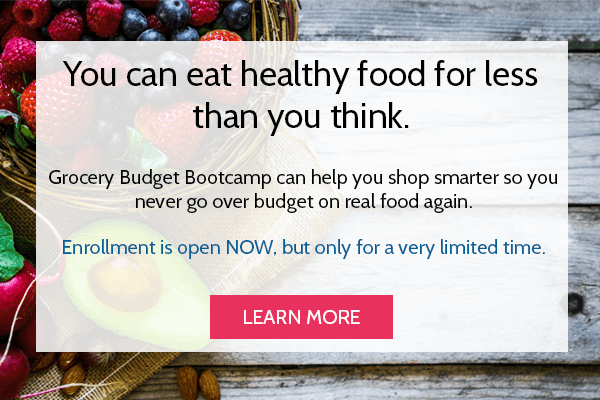 That led me to create this blog, my course Grocery Budget Bootcamp, and it allowed us to pay cash for our house. More recently, we embarked on the Whole30 (an elimination diet that prohibits soy, gluten, grains, sugar, dairy and legumes) and we were eating crazy amounts of meat. In order to stay within budget, I found ways to stretch ground beef and came up with what is now our FAVORITE ground beef taco meat recipe! There are two reasons why this ground beef taco meat recipe is my favorite. First, you bulk up the ground beef with vegetables. As I shared in my post on how to stretch meat at home, there are a variety of tricks you can use to make a little bit of meat go a long way. The problem though, is many of those ideas rely on starches or legumes. 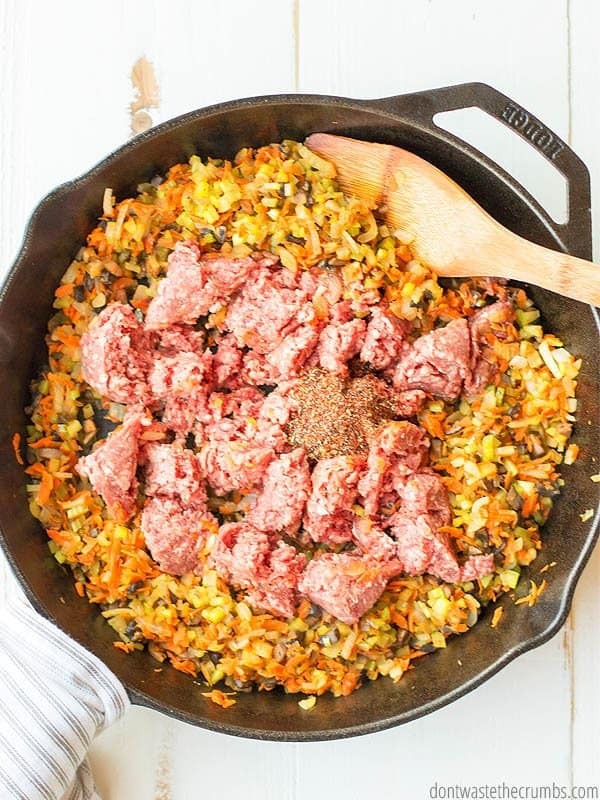 Rice, beans and lentils– the typical go-to ingredients for stretching ground beef– are all off-limits on the Whole30. And since we’re committed to buying grass-fed ground beef, I really had to make sure that one pound lasted beyond just dinner. In fact, I made a pretty far-fetched goal to make a single pound of ground beef last for dinner for three people (FYI – on the Whole30, kids eat like adults), plus at least six more meals. So essentially, NINE meals – that’s a tall order! The only way I could make it happen was to use vegetables. But at the same time, I had to make the entire pan of ground beef taco meat so good that A) my kids wouldn’t notice, and B) my kids would ask for more. Second, I love this particular ground beef taco meat recipe because it calls for my own homemade taco seasoning. I actually did a test and didn’t tell the kids. I used my own homemade taco seasoning. Everyone loved it. We had it in taco cups, served next to roasted vegetables and mixed with scrambled eggs for breakfast. I used this brand store-bought taco seasoning. I thought it was bland myself, and very lackluster in flavor. It seemed so boring! The kids didn’t come right out and say it, but they didn’t ask for seconds at dinner and they didn’t ask for ground beef taco meat for lunches. I took this as a sign that the original version made with my homemade taco seasoning was better, and not that I’m partial to my own recipe or anything, but I tend to agree. Besides ground beef, here’s what we have going on here. When you finely dice onion, I’ve found that they pretty much cook down into nothing. Literally. The teeny tiny onion pieces are so microscopic, that it would be a whole lot more hassle than it’s worth for any picky eater to try to push them off to the side or pick them out. The key though (which applies to all of these vegetables) is to dice the onion FINELY. If your onion cutting skills need improvement, just keep chopping on your cutting board until the onions are about the size of 2 pieces of rice. Yes, that’s small, but that’s the whole point. Similar to onions, you can’t see or taste the mushrooms when they’re finely diced. I like to use brown or cremini mushrooms because they taste better to me, more hearty, but you can use white mushrooms, too. If you have kids who will notice the difference in color between the white mushroom and brown meat, I highly recommend using brown mushrooms. You won’t be able to get the mushrooms to be as small as the onions, but you do want them small. Think the size of 4 pieces of rice. Celery is a vegetable that doesn’t have much flavor on its own, but it can add a punch of flavor when it’s mixed with other foods. That rings true for this ground beef taco meat recipe. You want your celery to be about the same size as the onions OR no bigger than the mushrooms. I personally prefer having it closer to the onion size for the sake of uniformity, but I confess I can sometimes be a bit Type-A about that kind of stuff. You do what works for you, but the key will be to dice it up finely. The only vegetable you won’t dice is carrots. It’s time-consuming and a huge pain so let’s not even do it, okay? Instead, we’re going to grate the carrots with a grater! I have a box grater similar to this one, but any box grater will work. You want small-ish shreds of carrots and you can achieve this one of two ways: either use the medium holes (not the big holes you’d use for long shreds of shredded cheese and not the teeny tiny holes you’d use for parmesan) OR use the big holes, but use a short stroke as you shred the carrot. I will admit that because of their color, carrots are noticeable in this ground beef taco meat. Thankfully, most picky eaters like carrots. We’ve been eating a lot of cabbage since the Whole30. We really like egg roll in a bowl (and I LOVE that it comes together so quickly!! ), but my husband has been adding shredded cabbage to his morning hash, too. Cabbage is a great vegetable to use to stretch ground beef and you can definitely include it in this recipe, too. I personally haven’t tested it myself, but I’d say dice it up finely like you do everything else and you’ll be fine. Cabbage cooks down pretty well and it should blend in nicely with everything else. What if you’re not a fan of ground beef? This same technique works with ground pork, ground chicken and ground turkey, too!! Yes! The vegetables will let out liquid as they cook, so it’s important to use a shallow pan. 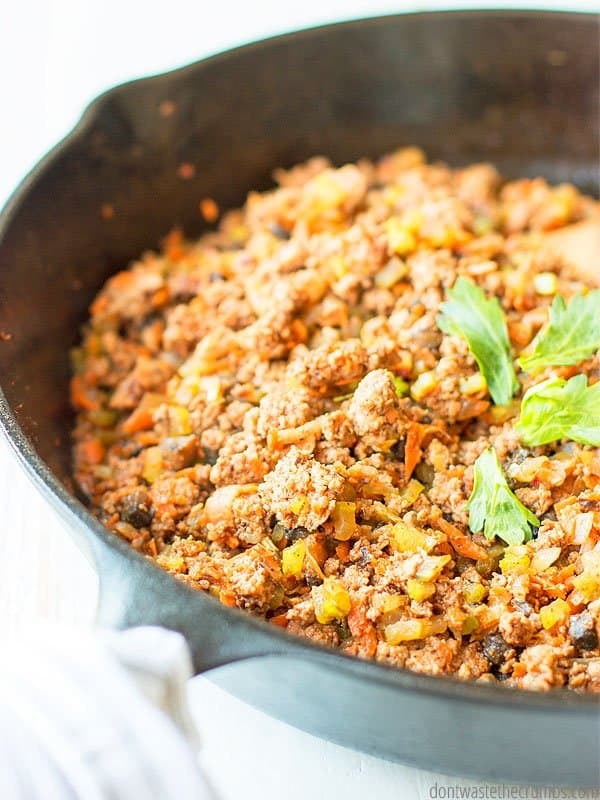 This allows the excess liquid to evaporate quickly and create a delicious ground beef taco meat that’s solid clumps instead of soggy meat mash (which we don’t like!). I used this 12” cast iron skillet and it was the perfect size for this recipe. Does this ground beef taco meat freeze well? Since I’m all about freezing things for later (a la yogurt and tomato paste and breakfast sausage and meatballs and even this step-by-step freezer cooking guide), you can make a double (or triple!) batch of this and freeze it for later. You’ll probably only have enough room in a 12” skillet for one batch at a time, but you can remove the recipe from the skillet at the end into a 9” x 13” glass baking dish and set it aside to cool while you work on the other batches. Once everything is cool, portion the meat into 2 cup servings into freezer-safe containers, and then place those into a larger container. Double wrapping prevents freezer burn, which doesn’t ruin food, but can make it taste less appealing. Tip #1: I freeze meat in sandwich bags, then put those sandwich bags in a larger gallon bag. I typically re-use plastic bags if I keep something like pretzels or grapes, but I don’t re-use any bags that I’ve used to store meat. I’ll toss the smaller sandwich bags, but re-use the gallon bag since it didn’t touch the meat. This also makes the meat a bit more flexible for my tiny freezer! Tip #2: I like the types of baking dishes that come with lids, like this one. It’s great for traveling, yes, but I REALLY like it because if I run out of time to portion everything in the freezer, I can cover it up and put it in the fridge! For most casseroles, 2 cups of meat is all you need. Stretching this ground beef taco meat before you add it to a casserole means you’re REALLY getting a lot of meals for just one pound of beef! If you’re making something else or feeding a family on the Whole30 (here’s a sampling of what we ate in a week), freezing in 2 cup portions lets you easily pull out additional bags. And if you’d like more freezer meal ideas, especially ones that include grocery lists and all the hard planning work has been done for you, go HERE. … is to use a pastry cutter. I had this one, but sadly it didn’t make the move to Georgia. 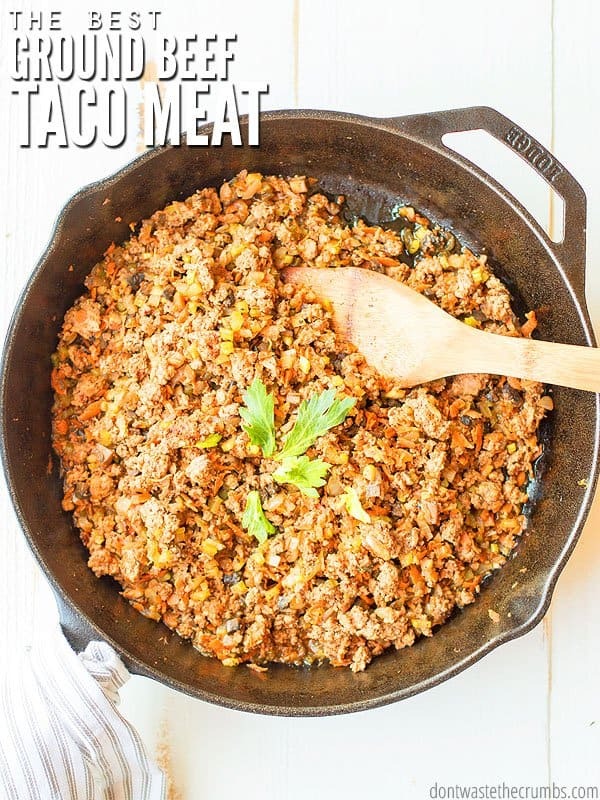 Need an amazing taco meat recipe that lasts for more than one meal? Start with quality ground beef. I like to buy mine from Butcher Box. Read about my experience with them HERE and my UPDATED review HERE. 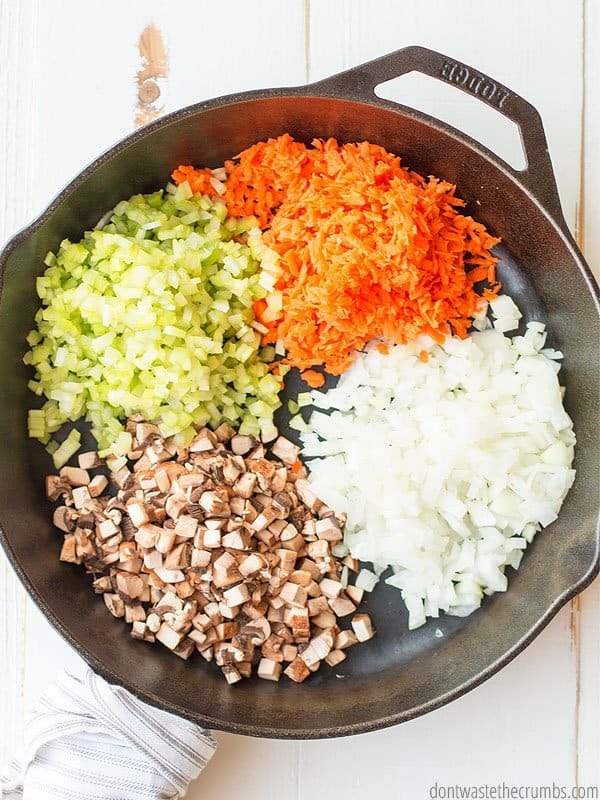 Onions, mushrooms, celery, and carrots are perfect for this dish. Chop them finely, but grate your carrots with box grater like this one. You need a shallow pan like this 12′ cast iron skillet to ensure all the liquid evaporates. This meat is PERFECT for freezing, which means you can cook once and eat twice. (More on that fantastic idea HERE.) Portion out and double wrap in baggies in the freezer then use a pastry cutter to break up the meat when you’re ready to cook. In a large heavy bottom skillet (I use my 12” cast iron skillet), warm olive oil over medium heat. 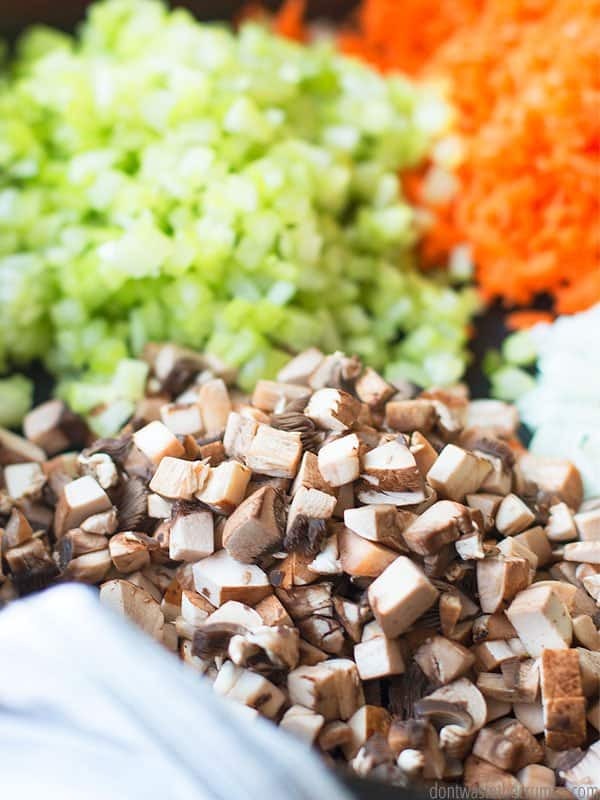 Add onions, celery, mushrooms and carrots and cook, stirring occasionally, until the onions are translucent. Add the ground beef and taco seasoning. Break up the beef using a pastry cutter or a wooden spoon and stir until everything is mixed well. Cook the ground beef on medium heat until it’s no longer pink. The juices and water should be evaporating, but if they’re not, you can turn the heat up slightly. Stand at the stove if you turn the heat up and stir constantly so as not to burn the meat or vegetables. Serve as you would ground beef, preferably in tacos! How do you stretch ground beef taco meat? Do you add vegetables, rice or beans? I’d love to hear your ideas in the comments! I would just like to add, I have an electric 4-cup chopper that chops onions, mushrooms, celery, and carrots to a great minute size. I use it all the time when I make soup with vegetables in it because my daughter does not eat many vegetables at all. I can put vegetables in anything, and she will eat them if I chop them in the chopper. Thanks for the tip Missy! Hi Missy, not sure if you will see this question, what kind of chopper is it? I add pureeed or grated zucchini or squash and a can of pumpkin purée to stretch mine, and I sometimes throw in celery or mushrooms as well. It’s not no carbs, of course, but sometimes I also add retried black beans. I much prefer the texture over whole so I can pick pretend I’m eating straight up meat. 😉 Depends what I have around. My friend was over when I attempted to stretch some ground beef for us and six kids for a taco salad. She didn’t tell her kids about the additions, and They unsuspecting oh gobbled it up. Some had seconds, and my friend even noted that the pumpkin gave it a creaminess that made her not miss the cheese. There was even enough ledt for my husband to have it when he came home from work, and I thought surely he’d be digging For leftovers! I love these creative additions Christie! Thanks for the ideas. My husband is a hard “no” on celery, but I can use all the other ideas. Fantastic. I didn’t have all the ingredients but used what I had and your idea here and was pretty shocked when my kids gobbled it up and didn’t appear to even notice!! I’m doing it from here on out and love that it’s adding nutrition to the meat but also stretching it so it’s frugal! Win, win in my books. Thanks! We make tacos ALOT! I usually use over 2 lbs of ground beef for the 4 of us (this includes 2 teenage boys who love tacos) and the meat is almost gone. Often I would grate some veggies I.e. carrots and zucchini but your idea of the brown mushrooms/onions/celery chopped small is great!! My younger son would ALWAYS pick out the mushrooms but because they were chopped small he did not notice….. I felt with all the veggies this is a much healthier version of tacos and everyone loved it …… ESPECIALLY with the homemade tortillas. Thanks for all the helpful practical tips!! You have homemade taco seasoning in the recipe but where is the recipe for it please? Oops! Sorry about that Norah! Here it is: https://dontwastethecrumbs.com/2018/05/homemade-taco-seasoning-recipe/. I’ll update the recipe too. Thank you for pointing that out to me!